Castor Oil has been used for over 4 thousand years for many health applications. 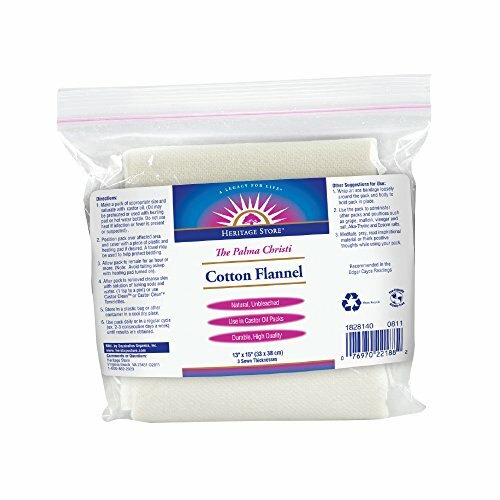 With its incredible ability to help with damaged hair and dry skin - it is no wonder that many have referred to it as the “miracle oil.” That’s why Heritage Store brings you our durable-yet-soft Cotton Flannel – a favorite for many folks! We believe that health products should be made in a healthy way, period. Our Cotton Flannel is of the highest quality and sewn in the United States. Extremely durable yet soft on the skin, our Cotton Flannel is natural and unbleached. Fully reusable, you’re sure to find relief and comfort many times over with this applicator. The Heritage Store has been the most complete supplier of castor oil therapy products and other natural formulas since 1969. Based on Edgar Cayce's, the father of holistic medicine, inspiring legacy of health, Heritage Store products have continued to be a source of strength and health support. Let us improve your life with our Cotton Flannel – order yours today! ☛ It Holds The Castor Oil Perfectly And Is Very Soft.